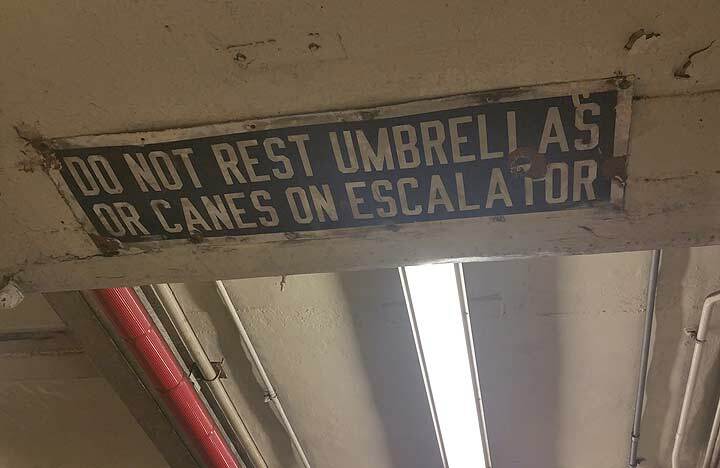 At the President Street station, on the IRT Nostrand Avenue line, this may be the oldest remaining sign of any kind in that division, probably dating from the line’s construction around 1920. An escalator is necessary here due to this being the deepest station on that line. Since all the other stations along the Nostrand Avenue are fairly close to the surface, ordinary stairs will suffice. You may wonder why this sign has not been “borrowed.” Well, that’s because it’s in direct view of the station agent and since it’s above a constantly moving escalator, it’s difficult to appropriate! That was my line growing up in Flatbush…My stop was Winthrop Street two stops down towards Brooklyn College end sta.